Most of us are familiar with the feeling of a humid apartment after taking a hot shower. Some of us kick on an exhaust fan, perhaps unfog the bathroom mirror, or even open a window to get the moisture out. Domestic moisture generation—moisture from human activity—is a major factor driving the humidity levels in our residential buildings, especially in superairtight Passive House construction. Breathing and transpiration—6 to 9 lb of water vapor per day. Ten-minute shower in the morning for each individual—3.6 lb of water vapor. Cooking fried eggs and bacon for breakfast—0.5 lb of water vapor. Cooking steamed vegetables with pasta for dinner—0.5 to 1.0 lb of water vapor. One small dog and a few plants around the house—0.5 lb of water vapor per day. This brings the daily total to between 11.1 and 14.6 lb of moisture generation per day, or about 1.5 gallons of liquid water. Where does all of this moisture go? In a typical code level apartment building with moderate to high levels of air leakage, water vapor has two year-round exit pathways: exfiltration through the façade and dedicated kitchen or bathroom mechanical exhaust. In the summer, moisture is also removed via condensate from the cooling system. Let’s now put this in the context of a highly energy-efficient apartment with very low levels of air leakage (about 5 to 10 times less than the code-compliant unit), and balanced ventilation with energy recovery. The first means of moisture removal, façade exfiltration, is virtually nonexistent given the building’s superior airtight design. Next is mechanical exhaust ventilation in the kitchens and bathrooms. Because the unit has balanced ventilation and energy recovery, the exhaust airstream in a Passive House project typically passes through the energy recovery core. Depending on the core selection, a large percentage of the interior moisture may be retained in the apartment air despite the constant mechanical air exchange. HRV, in which a certain percentage of sensible heat is recovered (transferred from the exhaust airstream to the supply airstream) while no moisture is recovered. ERV, in which a certain percentage of sensible heat and a certain percentage of moisture in the air is recovered. 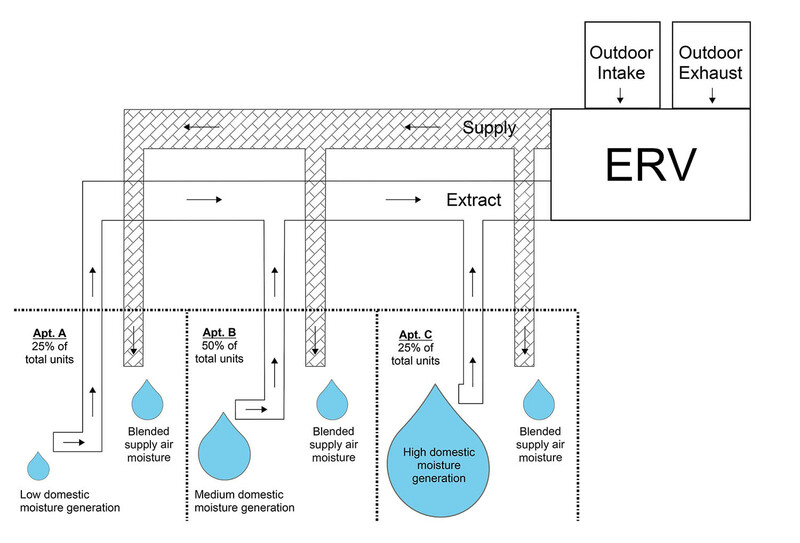 Table 1 breaks break down the moisture-related pros and cons of ERVs and HRVs in the context of a high-density Passive House building. Traditionally, the key factor in deciding between an ERV and an HRV for a high-efficiency building has been the project’s climate. However, as internal moisture loads begin to exceed exterior moisture loads in high-density projects, the decision between ERV and HRV must be looked at more closely for each project regardless of climate. Will interior relative humidity (RH) levels get high enough in the wintertime to cause condensation potential on the windows? Is the ERV’s airflow boost capacity enough to mitigate high interior humidity levels? Takeaway #1: Weekday interior RH levels will peak anywhere from 50% to 63% in the morning and early evening. The largest peak will occur during the morning breakfast hours. Takeaway #2: Weekend interior RH levels will remain between 50% and 70% over the course of the day. Takeaway #3: Boost flow on the ERV during high-humidity conditions will only slightly reduce peak humidity levels. Takeaway #4: Due to high predicted interior humidity levels, localized supplemental dehumidifiers may be required. Takeaway #5: Some ERV cores can have a much greater moisture recovery rate in the winter season than in the summer. These seasonal differences are not typically reported by manufacturers and should be confirmed for each project. As the project progressed, a decision was made to switch to four centralized ERVs. The model was then revised to account for a normalized amount of air mixing that would occur with the centralized design. See Figure 1 for a schematic of this concept. In other words, not all apartments will be generating high levels of moisture at any given time. Therefore, the supply air going back to each apartment will result from a blending of the average humidity conditions across the project’s 70 units that each centralized ERV services. The revised moisture model, which was based on using centralized ERVs, yielded a noticeable reduction in apartment interior RH when compared to the decentralized model. On a typical weekend day in winter, the model was predicting that average apartment interior RH percentages would remain in the low to mid-50s for only a few hours during those times when domestic moisture generation peaks. While the centralized ventilation approach largely reduces the risk of high moisture levels in the apartments, additional controls are being specified for the centralized ERV units to further alleviate this risk. During periods of cold exterior air temperatures and high return air humidity levels, the ERV will have the ability to partially bypass the enthalpy wheel to flush the moisture out of the apartment air. Figure 2 depicts the substantial effect of incorporating this ERV cotrol. Figure 2. Moisture model on a typical weekend day in winter. 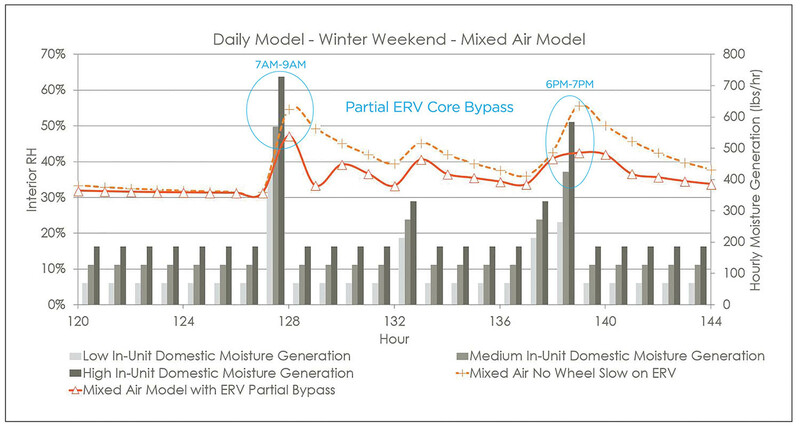 Our modeling shows that this approach of utilizing partial core bypass controls on the ERV effectively mitigates high interior RH levels in the wintertime, and reduces the risk of condensation on the project’s windows. However, this approach is certainly not ideal. During periods of partial core bypass, heating loads will increase, due to the reduced rate of sensible heat recovery from the exhaust airstreams. It is rare to find a perfect solution to a problem. Because we have very little control over domestic behavior, we’ll likely need to lean on engineered solutions to grapple with unpredictable behaviors and interior humidity. Cooling systems are a good place to start. Cooling systems that better match the low loads in Passive Houses could enhance their dehumidification potential in the summer, thus making HRVs more favorable for projects. HRVs will completely flush moisture out of the apartment air during the winter months when a risk of condensation may be present. Another thought is to take a page out of Intel’s book and incorporate dual-core technology in our ventilators. The potential solution could be a ventilator that automatically switches from an ERV to an HRV core from season to season. Whatever the actual solutions may be moving forward, it’s critical that we begin to think about them. This issue will become more prevalent as we design tighter, denser multifamily buildings. Dylan Martello is a senior building systems consultant and CPHD at Steven Winter Associates, Incorporated.